Few know that Azerbaijan has its own ice hockey team! True, it’s based not in the territory of Azerbaijan, but in Russia and plays in one of the Russian leagues . The team mainly consists of Russians who have expressed a desire to perform under the flag of Azerbaijan. The only Azerbaijani, Orkhan Kazimov, is playing in it. The head coach of the national hockey team of Azerbaijan is Valery Laryukov, who is also the secretary general of the Azerbaijani hockey federation since 1991. It should be noted that Valery Laryukov was the general director of the Russian Hockey Federation from 1993 to 1998, headed the amateur hockey league in 2000-2002, since 2003 he has been an adviser to the President of Russia on physical culture and sports, since 2014 he is vice-president of the Kaluga Hockey Federation region. In an interview with Echo.az correspondent Valery Laryukov spoke about the history of the creation of the Azerbaijan Hockey Federation, as well as about our national team that acts under his leadership. The Azerbaijan hockey federation was established in 1991. At the same time a school was opened, which was based in the ice palace (now sports and concert complex named after Heydar Aliyev. ), In which about 200 children of various ages were engaged. After the collapse of the USSR, in 1992, the World Championship was held in Prague, and then I received a call from Moscow and offered to represent Azerbaijan and joining the International Ice Hockey Federation, since at that time there was a school and a base where the children were able to trained. As a result, during the Prague World Championship, Azerbaijan, Kazakhstan, Ukraine and the Baltic countries were included in the International Hockey Federation. At that time, representatives of the Popular Front headed by Abulfaz Elchibey came to power in Azerbaijan. Upon our return to Baku, we found out that the leadership of the Sports Committee (now the Ministry of Youth and Sports) was replaced. The head of the department then became a representative of the Popular Front, who made it clear that attention would be paid only to national sports. Why did they invite you to represent Azerbaijan at the World Championship in 1992? The fact is that during the USSR the Union republics asked specialists from Moscow to develop a particular sport. Considering that the ice rink was built in Baku, then the famous Anatoly Tarasov asked me to come to Baku and help develop this sport. And he said: “We need to develop hockey in Azerbaijan”. So I found myself in Baku. I then worked in the Ufa Salavat Yulaev system, and had a lot of experience in coaching and only went to Azerbaijan at the request of Anatoly Tarasov. After returning to Moscow, I worked for five years as the general director of the Russian Hockey Federation. Then I was constantly called by the head of the International Hockey Federation Rene Fasel, I was interested in why I did not participate in the congresses of the International Federation, as I am the secretary general of the hockey Federation of Azerbaijan. At the same time, every year I paid my membership fees. The problem was that I did not manage to establish contact with the sports leadership of Azerbaijan. Nevertheless, I began to participate in all congresses meetings of the international Federation and represent Azerbaijan. Note that I did not ask for money, I need only an administrative resource. What does this mean? In particular, it is necessary to naturalize children who are ready to perform under the Azerbaijani flag. In addition, it is necessary to register two hockey clubs in Baku, even at a formal level. Considering that currently there is no adequate support and technical base for hockey competitions in Azerbaijan, the championship of Azerbaijan was held outside the country, here in Russia. I gathered about 30 guys and took part in a friendly hockey league of Russia an won the “Silver” division under the brand of the Azerbaijani national team. I wrote many letters to the National Olympic Committee (NOC) of Azerbaijan, the Ministry of Youth and Sports and the Azerbaijan Embassy in Russia and other institution, but, unfortunately I received no response. I repeat, at present we do not ask for money, the parents of the children pay for for themselves ice rent and hockey equipment. Tell us about the composition of the team? The team includes Russian Kids and Azerbaijani Orhan Kyazimov. He has Azerbaijani roots both his father and mother, but he was born in Moscow. Basically, these are young kids aged 17-18. I only take exclusively young athletes for the future of Azerbaijani Hockey. What is the motivation of Russians to act under the brand of the national team of Azerbaijan? First and foremost, they are very fond of hockey. When people love hockey, they go to any country to demonstrate their skills and play there favorite sport. 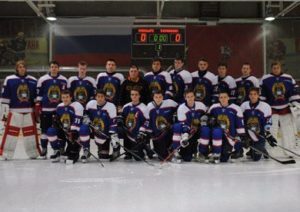 In Russia, they fail to play for the national team in terms of their skill level, but they let them move to countries like Armenia or other countries where hockey exists more or less, so it is possible to attract players to Azerbaijan. What are the results of the Azerbaijani national team in the friendly hockey league? At present we are located in the middle of the standings. In this league, mostly former professional players, all adults, play. Our team is staffed exclusively from young players, so we can say that we are performing quite well. Our young hockey players practice and play with more experienced players, which contributes to their progress. Given that Russia has such a strong hockey league “Kontinental Hockey League (KHL)”, which is the second the best league in the world after the NHL, the leaders of Russian hockey could be interested in expanding the geography of the league to Azerbaijan. is there interested in participating in the KHL? If Azerbaijan were to create a high-level team and had interest in starting such a team I would be able to start a team in any Russian league, including the KHL. I also have good connections abroad, with Europeans, Americans and Canadians. Did you try to contact the Federation of Winter Sports of Azerbaijan? I probably addressed the head of the Federation of Winter Sports of Azerbaijan, Iskender Khalilov, who lives in Moscow five hundred times. But he refers to the economic crisis in Russia. It is necessary to have 150 thousand rubles to form the national team of Azerbaijan, but this amount can not be singled out. I note that even our Turkish colleagues invite us to train. At the same time, they are ready to pay for the rental of ice, has long as we train together with Turkish hockey players and conduct joint training camps, competitions. In Turkey much has been done to develop hockey. But In Azerbaijan the interest is very low it’s impossible to solve the problem in Azerbaijan for the sport of Hockey. Hockey is one of the most popular sports that is included in the Winter Olympic Games, and it’s a big mistake that they do not want to popularize it. If there is a skating rink in Azerbaijan, four kinds of sports can be developed at once: figure skating, hockey, short track and curling – all of them are Olympic sports. Apparently, the sports leadership of the country has a skeptical attitude to winter sports? There are many countries with a warm climates, where there has never been a tradition of winter sports but they have began to develop winter sports. For example, at a recent congress in Moscow came a representative from Nepal, where they created a hockey federation. In the Arab countries also began to pay attention to hockey and began to invite Canadians. So the lack of traditions is not a problem for development of hockey.